What Are They Chattering About Me on CNN? RUSH: Here are these audio sound bites. I still don’t remember when I said this. I’m not denying I said it; it’s on tape. Don’t misunderstand. But on CNN this afternoon, their program Inside Politics (sound bites 21 and 22 here), John King speaking with Franco Ordonez — he’s the McClatchy White House correspondent — and with Mary Katharine Ham of The Federalist. 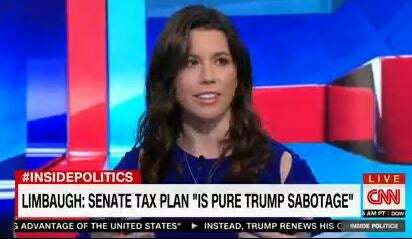 It says here about me and my comments that the Senate tax plan is intended to sabotage President Trump. Now, to set things up, here is John King of CNN introducing and playing an audio sound bite of me from yesterday’s program. KING: GOP leaders say all will be fine in the end. Meaning once the House and the Senate pass separate plans, they’ll negotiate a compromise. Well, count Rush Limbaugh among the skeptics. RUSH ARCHIVE: Wer’re exhausted. Ten years, no results. Now the Senate Republicans are torpedoing tax reform. The stock market’s down 200. “We want to delay these corporate tax cuts until 2019. We don’t want to phase those in.” This is pure Trump sabotage, is what’s going on — and, if it’s Trump sabotage, it’s you being sabotaged, you who voted for him. That’s what ticks me off. KING: You could write off what you hear from Rush as chatter. Uh, but if you are a conservative in the country and you turn on talk radio, the skepticism is real. Uh, they remember the Obamacare debacle, they don’t trust Mitch McConnell, and they think somehow, uh, they’re gonna mess this up again. RUSH: It’s not chatter. Why delay the corporate tax cut…? Dare I say this? The corporate tax cut — gee, folks, I… (sigh) I don’t want you to get mad at me. The corporate tax cuts is where the tax cuts really are, and therefore where the economic growth is going to come from. It’s a significant rate reduction, 35 to 20%. Here comes the Senate wanting now to delay it to 2019. Well, let me tell you what that means. That means it’s not gonna happen, because whatever legislation they write today that requires something happening in 2019? Well there’s still two years to go, a year and a half to go before 2019. So somebody can come along and write new legislation next year eliminating the whole thing. That’s why it has to be done now, because it can always be undone, too, but tax reform is not a piece of legislation you can tackle every year and start adding to and erasing willy-nilly. You can see how complicated this is. But delaying the start of this and then phasing it in at that point until 2019 is the same thing as not including it, if you ask me. 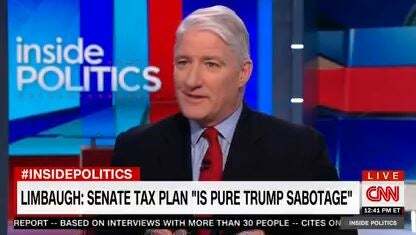 So after there was some discussion at CNN, John King once again resumed the microphone. KING: To Rush’s point, you know, why would you delay the corporate tax, the White House obviously wants that as soon as possible. Yet, they said complimentary things about the Senate plan, thinking, let’s just keep this moving, keep the train on the tracks, we’ll worry about the details a little later. HAM: I think Virginia scared them into action, not into inaction. RUSH: Right. So the CNN panel seems to think the White House Republicans are so desperate to do something that this is gonna pass, no matter what they do. Even if they delay the implementation of the corporate tax rate reduction for four years, three years, whatever, that it’s still going to pass, that they’ve gotta do something based on the results from Virginia scaring them into action or what have you. There’s no doubt some of that. But I don’t think it’s strictly the elections in Virginia. Are you telling me that if Gillespie had won, that the Senate would have said, “All right. We don’t have to do anything now”? If Republicans had won that, if Gillespie had won, would the thinking be, “Okay. We won, so we can continue to delay the Trump agenda.” Do you think that would have been their reaction? It might have been. We don’t know. RUSH: Thank you so much for being with us today and all week, ladies and gentlemen, for what CNN describes as “Rush Chatter.” Ha. At least we have an audience here, Mr. King.